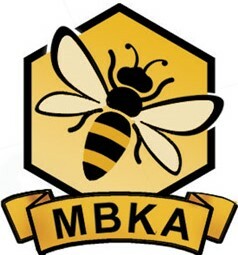 The MBKA Introduction to Beekeeping Course is held in Broughton Gifford Village Hall, SN12 8PN. The course starts on Thursday 25th April 2019. The course consists of 4 evening theory sessions, as well as 2 practical sessions, handling bees in the Club Apiary in Rowde, near Devizes. The 4 evening theory sessions run from 7:00pm - 9:00pm, including a break for refreshments (free). The 2 practical apiary sessions will take place on a Saturday or Sunday after the theory sessions of the course, but exact dates will be arranged nearer to the time, dependent on the weather. The course costs just £40 for the 5/6 sessions. Couples can attend as a cost of £60. Under 18s are FREE (limited spaces). The fee should be received in advance at the time of booking. Please use the booking form to book your place and send it along with your cheque. You can also pay by BACs (details on the booking form). We advise booking early as the course is always oversubscribed. The contents of the course will teach you most of what you need to know before you start keeping bees. However, if you decide to keep bees you will most definitely need one or two good beekeeping books from the beginning. You may wish to acquire a book or two before the course starts in order to be prepared. The following titles are recommended as good beginner's guides.